Gyeon Cure is a hydrophobic spray on sealant that will help extend the life of your existing coating layer. We are always looking for that extra bit of pop and/or protection with each and every detailing product we use. Even after spending hours polishing and coating your paint, we still want more! Gyeon Cure is that easy to use product that will add a bit more "pop" to the paint, without sacrificing valuable time. Cure can be used after washing, when the car is wet or dry. 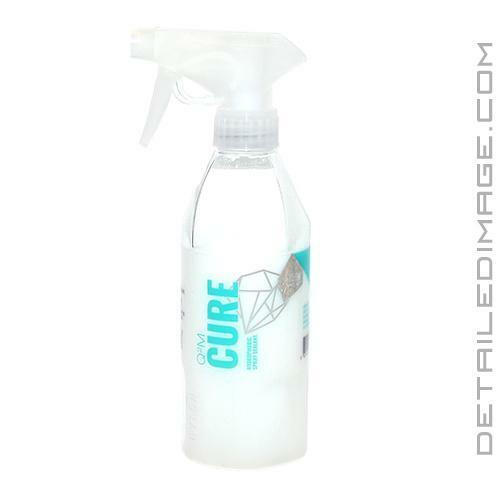 With just a few sprays per panel, Cure will refresh the coating underneath and add extra gloss, along with extending the durability of the protection layer. This will in turn help keep the surface cleaner for longer and protect against dreaded water spots. The secret is in the SiO2 (i.e silica), which helps add extra hydrophobicity making the surface feel slickcombined with fantastic anti-static properties. If you are using this product after washing, when the surface is still wet, you will really enjoy how it aids in drying. Your towel will glide across the surface and water will bead off the paint with ease. 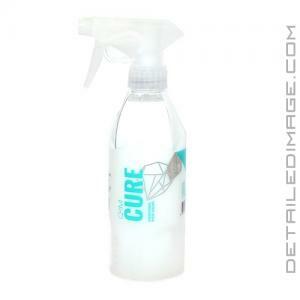 With regular use, Cure will help keep your coating looking its best and lasting as long as possible. Add that extra bit of gloss and keep your coating in tip top shape with the Gyeon Cure! In the end, I have enjoyed using Gyeon Cure. I feel it works well as a gloss enhancing, hydrophobic booster to a coated vehicle. It is a bit more expensive than similar products such as CarPro Reload and Gtechniq C2 V3, but it is in the general ballpark. If you've got a Gyeon coated vehicle, or are just looking to try out a new spray sealant, consider trying Gyeon Cure. Ultimate maintenance product for any quartz coating. Up to 8 weeks paint protection. Use only on a clean surface. Spray at a panel at once and wipe off with a microfiber wet/dry use possible. Makes drying the car easier. I purchased cure to go over top of can coat and as a maintenance product for can coat, going on a 2019 red RAM 1500. Application was simple, I had coated the whole vehicle the night before with can coat, finished around 10pm. Went back to apply cure the next day around 1pm and had no issues. The product applies thin, not much visible residue but even over can coat it creates a lot more slickness and you'll know it's on the paint when you wipe off. My favorite part was how much gloss it instantly adds to the areas I didn't polish like the door sill areas. I wiped with gyeon prep, then did one spray for all 4 doors, applied and wiped and instantly created a slick glossy finish right before my eyes. Pretty cool! Works just as well on plastic and chrome although it didn't seem to increase the gloss on those surfaces over what can coat already did which is perfect, can coat left a nice mild deepened black finish already on the plastic and chrome was mirror finish already. I will say, after using multiple gyeon products the last two weekends they are oddly similar to carpro products in use, viscosity, and even scent but possibly better performance overall with slightly higher cost. I feel it's worth the cost in this case. Cure is a great product. I have been using it as a maintenance product for coated paint. Has some great hydrophobic properties for a silica spray sealant. Easy to work with and apply. Great for maintaining Gyeon Mohs, Prime and CanCoat. I have Gloss Coat on front fascia of 2015 Nissan Rogue in Jet Black to help with cleaning, and sealants/waxes on rest of car. Purchased Cure to add hydrophobicity to Gloss Coat. I does that but is now attaching all sorts of water spotting - not sure why this is - don't know if Cure just doesn't like Gloss Coat, or if there is another problem. Due to high contaminate rural area and working at sawmill I utilize free pressure rinse daily when leaving work, resulting in water spotting in low airflow areas, especially rear corners and deck. When using Cure over waxes/sealants (JetSeal base with alternating layers of Opti-Seal, paste waxes, and Meg's Ultimate liquid and spray waxes - Wolfgang Uber rinseless wash for maintenance) I have no problems - easy one and off, leaves great shine, and has reduced water spotting in low airflow areas which is what I was after. I use Cure once every three weeks along with Meguiars Ultimate Spray Wax and Detailer as drying agents during rinseless washes three times a week. Cure works well as a drying agent during rinseless washes and has significantly reduced water spotting in low air flow areas. Recommend giving it a try if you need added hydrophobicity. Follow Up: The key to using with Optimum Gloss Coat is to clean the surface really well with Optimum Paint Prep before applying Gyeon Cure. Once you do this combination works perfectly - great shine and superior slickness against bugs and water spots. If you have Gloss Coat then Paint Prep is your friend! If you do not use a coating rejuvenator like Cure, then use Paint Prep as a maintenance product to clean Gloss Coat - it will not deteriorate the coating. If you use Cure, then you can use rinseless washes to keep clean. I use Wolfgang Uber Rinseless Wash as it has good lubricity during cleaning, and leaves a slick surface. Once a month I strip Cure with Paint Prep, then use Optimum Mineral Deposit Remover on water spots, then Paint Prep again to get surface very very clean, then reapply Cure. This process goes quickly once you get it down, and leave a beautiful and super slick finish. Thank you...can't beat your customer service.